When it comes to jeans I think we’ve all been sold a pretty straight forward story over the past few years. We’re told, from every source that can be utilised, that more expensive denim means a better fit, a better quality and a better overall look and feel. This is going to date me but I can remember the days when people were open mouthed over the idea of paying $100 for a pair of jeans. Today we have denim coming in at over $1000 and we’re not even talking a full decade of growth here for the industry. Designer denim is massive. That all being said, I’m not claiming designer denim is the enemy. I am, however, most certainly spreading the news that there is another way for your arse to look amazing in jeans and it comes with a much smaller price tag. While I was home in the USA this summer, I spent eight weeks in a state of constant perusal. I often am when I’m at home – half for my own shopping enjoyment and half to be able to come back here and speak knowledgeably about what’s going on back there. Here’s what’s going on as far as I can see – OLD NAVY ROCKSTAR JEANS! I think it’s been about a year now since I mentioned the Old Navy Rockstar Jean. When they were first launched they had a slow burn rate. People were curious, purchased and then seemed to keep their secret denim purchases to themselves. I actually had lunch with a friend last year, enquired after her denim and was told they were discovered in a vintage shop. I was gutted. That next week, in the southern states, I marched into an Old Navy looking for a bikini and discovered her exact pair of jeans. That little trickster. I totally called the denim diva out on her little lie and we made amends and agreed to never lie again when it came to bargain buys. How come we are ashamed of a jean that comes in at under $40 (and some on sale for as low as $25 for the moment)? Well, ladies, let me be the first to tell you not to be ashamed, but rather to run, not walk, to your nearest Old Navy to score a pair of these Rockstar jeans in every colour and rise combination. I am currently sitting on a stock of ten pairs that I wear every other day of the week it seems. From classic faded denim to black rinsed ripped knee skinny jeans, I have truly never worn a more comfortable or more flattering pair of trousers. Maybe it’s the incredible stretch I love above everything else. Yes, I do think that’s it. Don’t worry, we’re not talking Jeggings here. Who created those monstrosities anyway? These are truly jeans with an extra something special to lift, flatter and shape like nobody’s business. The Rockstar Jeans also come in different lengths, from petite to tall and also come in sizes up to a US 20. Yes, my hero has arrived and he comes in the form of jeans that skim the floor. How long I have waited for that day to come! 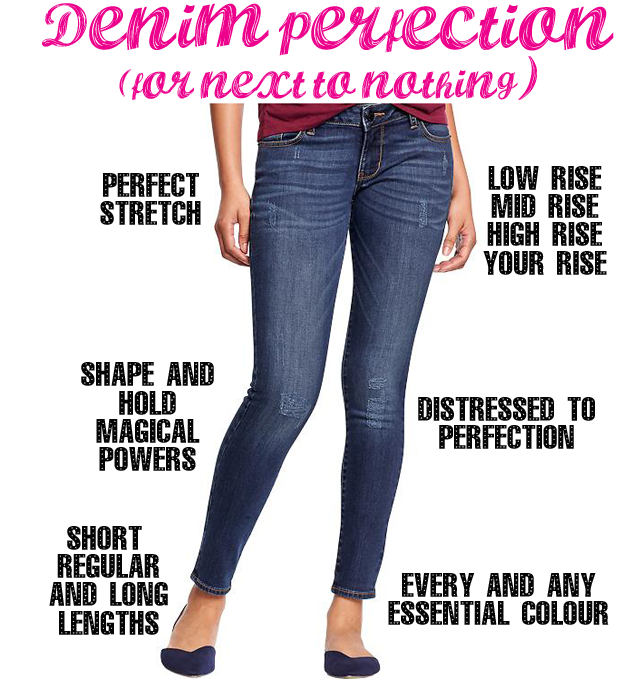 To sum up this love letter to Old Navy Rockstar Jeans, let me just say I stake my reputation on you loving them. This isn’t a paid endorsement. It’s just me sharing a product that I discovered by chance and have been obsessed with ever since. Go, buy, and become a true Rockstar (at least when it comes to your denim choices).